Fenerbahce Veteran Table Tennis Club is in İstanbul, Turkey. 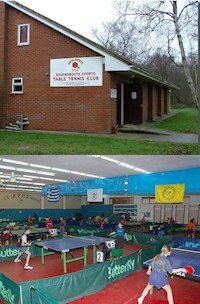 The club is a very active, friendly and lively table tennis club mainly for veteran players. The club also encourages and invests in young players by running an all year round training school. The cost to play at our club is 3 euros per day or 30 euros per month and we are open from 16:00 - 22:00 hours. The playing hall contains 8 ITTF approved tables and in the club area there is a small restaurant as well as lockers. Our club has a heater and air conditioning, is 6m high and is slightly smaller than a basketball field with an all wooden floor. In the summer it's possible to go out to the little green garden and enjoy a nice conversation with snacks, meatballs, next to a little electric powered waterfall. The top of the garden is covered with grapes. We have registered 60 club members but more than 120 players come regularly. Normally people come as single players and match on the benches and play. So it is not like tennis clubs where you must go as a pair. Good players are usually kind enough to play with beginner and intermediate players. We visit other clubs to play with their players as well. Our club also offers coaching and we have two coaches who charge 20 euros per hour. Every sunday we have an open tournament with an average of 40 players. The winner gets a medal and we also take a photo of him and post it on our webpage. We also have a league of 10 divisions every 2 months. In addition, we organize an international tournament every year, in October. There have been 15 of them so far (as at 2014). The tournament takes place in the heart of Kadıköy, Istanbul. The sports hall is located in the middle of a pedestrian area full of bars, pubs, nightclubs, fish restaurants, shops, cafes, Turkish coffee shops, cinemas and art galleries. It is also 500-800 metres away from all hotels and boat piers. Many international players from all over the world come to Istanbul to participate in the tournament and enjoy the young, colorful and dynamic life of Kadıköy.